Today, as Emantic “EJ” Bradford, Jr. is being laid to rest, the Alabama Chapter of the National Lawyers Guild joins all those demanding justice for him and his family and calls for the immediate release of all video footage related to his killing. We condemn the use of the cop-talk term “officer involved shooting.” It is especially offensive when used by the media. It is a concocted euphemism meant to separate police officers from their actions. The officer who shot EJ was not merely “involved,” he was the principal actor and what he did was “gun down” or “kill” EJ. By the same token, no one should have accepted the Hoover Police Department’s now-retracted claim that EJ was “brandishing” a gun. It is a loaded term, implying he was holding it in a threatening manner, yet no evidence was ever offered to support the claim. Indeed, after the first shots were fired, a number of people in the mall took out their guns in hopes of protecting themselves and others. It appears that others were perceived by the police as exercising their Second Amendment rights. It is no coincidence that EJ, a young Black man, was perceived by his killer as the shooter. While the Hoover police retracted their original claims that EJ was the person who shot two others and that the officer who killed him acted “heroically,” the rush to judgment and the mentality that gave rise to those original claims are reprehensible and all too common. We recall that, after Attica prison was brutally invaded by New York State Police in response to a peaceful prisoner protest in 1971, Gerald Houlihan, the corrections department mouthpiece, claimed that nine officers held as hostages had all had their throats slit by inmates. This claim was spread across the country, repeated as fact by such newspapers as the New York Times and Washington Post and was ultimately proven to be a lie. All the dead hostages were shot by the police and their accomplices. And, if one were to claim that nothing like that could happen today, we need only look to Chicago and the murder of Laquan McDonald by Chicago police officer Jason Van Dyke. Van Dyke and his accomplices in the Chicago Police Department claimed that McDonald was attacking him with a knife to justify the sixteen rounds unloaded into the young man. EJ’s family’s demand for release of the video is justified by the fact that only after more than a year of demands and a federal court ruling did the dash cam video prove the officers were lying, leading to Van Dyke being charged with, and convicted of, murder and three other officers now being tried for obstructing justice and related crimes. The City of Hoover has made the hollow promise of absolute transparency going forward. All evidence has been turned over to the Alabama Law Enforcement Agency (ALEA), which is handling the investigation. Only if Hoover can retrieve the videos from ALEA can it make good on its recent promise to release information it could have released weeks ago. Now that Hoover has no information to convey, no evidence to produce and no involvement in the investigation, its transparency is transparently worthless. When it had the chance to act appropriately at the outset, it defended its officer and branded EJ a “suspect” which, in this context, was a conclusion, particularly in light of its calling the officer who killed EJ heroic. Better still would be a society in which young Black men are not automatically perceived as dangerous criminals. The officer who killed EJ may not be a conscious racist, but it is clear that implicit racial bias in the U.S. is pervasive, resulting in patterns of criminalizing stereotypes against Black people. That racism affects us all and, until we as a society confront and overcome it, more families will grieve. Finally, for those who feel that protesters disrupting mall shoppers or blocking traffic should not be inconveniencing members of the public who were not involved in EJ’s death, consider how they would feel if a member of their family were killed by police. These protests, however, go beyond the death of one young man because EJ’s death is one of many caused by the racism that inheres in our country. Black people have a long and proud history of opposing oppressive systems that affect them as a community and other poor and exploited people. The positive changes in our country have developed from marginalized people fighting to eradicate oppressive systems. As those protestors walked, they faced a lack of empathy and remorse for the effects that racial trauma has on their daily lives. Any of us who is not actively combating that racism, however pure our intent, is perpetuating the problem. The inevitable result is the perpetuation of injustice. 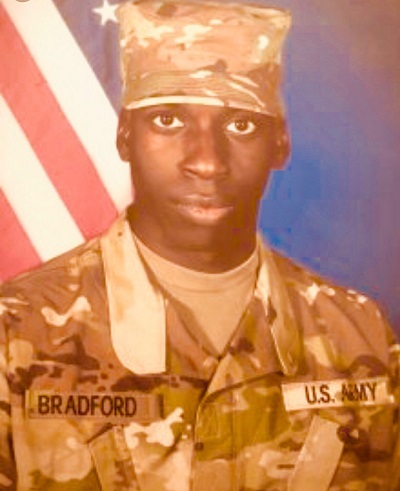 UPDATE 12/4: An independent autopsy revealed that EJ Bradford was shot three times from behind, in the head, neck and back. The National Lawyers Guild is the country’s oldest and largest human rights bar association and its first integrated national bar association, holding that human rights are more sacred than property interests. Posted in Announcements and tagged Alabama, police brutality, police shooting.